OST FEST: 2 stages, 62 hours of nonstop music and over 30 bands! For fans looking forward to the June 15, 2012 edition of OST FEST, they can now make plans for 62 hours of nonstop music, over 30 bands and 2 stages! 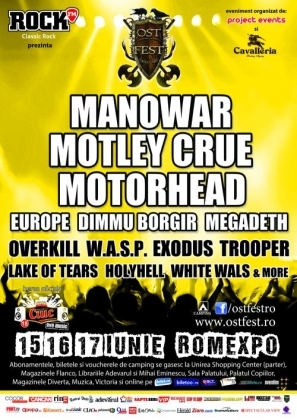 More details about the festival can be found by accessing www.OstFest.ro or the Facebook page www.facebook.com/OSTFESTRO. Tickets / passes / vouchers for OST Fest can be purchased online from BILETOO.ro, BLT.ro, BILET.ro, BILETE.ro, MYTICKET.ro or the Eventim network.